Hogun the Grim is a fictional character appearing in American comic books published by Marvel Comics. He is a charter member of the Warriors Three, a trio of Asgardian adventurers and supporting cast of Thor in the Marvel Universe. Hogun the Grim (right) of the Warriors Three. The character is portrayed in the Marvel Cinematic Universe by Tadanobu Asano in the film Thor and reprises his role in the sequels Thor: The Dark World and Thor: Ragnarok. Hogun first appeared in Journey into Mystery #119 (August, 1965), and was created by Stan Lee and Jack Kirby. Writer Stan Lee envisioned him as sharing several traits with characters played by actor Charles Bronson. Hogun is a member of a trio of Asgardian adventurers consisting of Fandral the Dashing, Hogun the Grim, and Volstagg the Valiant and referred to as the Warriors Three. They were members of the supporting cast in Marvel's Thor comics and usually provided comic relief and side-adventures. Hogun is not Aesir like most of the Asgardians. Also, his unnamed homeland was conquered long ago by Mogul of the Mystic Mountain, who slew Hogun's forebears and laid waste to the land. For a time he was apprenticed to the stone carvers. He joined with Volstagg and Fandral to judge a dare and formed a lifelong friendship. This dare, the "petting" of the Fenris wolf, led to a humiliating defeat for all three men. Afterwards, legends and tales would then stop referring to Hogun in cheerful terms and use dour, negative names. He is primarily characterized by his brusque, taciturn, and often short-tempered demeanor. He is the brooding pessimist of the group, as opposed to Volstagg's irrepressible good humor and Fandral's brash heroism. He is a fierce and unrelenting warrior, a collector of weaponry and often the voice of reason for the Warriors Three. Hogun has been involved in a great many adventures and quests, as a member of the Warriors Three, as an ally of Thor, and on his own. When first seen, Hogun had joined the quest for the power that had cracked the Oversword of Asgard. Soon after that, he helped quell a mutiny led by Loki. He then helped repel an attack of Flying Trolls in Thryheim. With Thor, he helped defeat the forces of Harokin. With Thor, he then battled the dragon Fafnir. With Thor, he defeated the Mogul of the Mystic Mountain, who had destroyed Hogun's homeland so long ago. He helped defend Asgard from the Destroyer. He encountered the Hulk. Hogun helped defend Asgard against Mangog. He encountered the Silver Surfer. With Thor, he battled the Thermal Man. He helped defend Asgard against Surtur. He helped Thor escape Mephisto. He became entranced by Infinity and was forced to battle Thor, Balder, Sif, and other Asgardians. He was freed from his trance by Loki and Karnilla. Hogun is the first to fight back when Loki takes confront of Asgard; he attempts to destroy the villain's power ring with his mace. This fails and Sif talks Loki out of murdering Hogun on the spot. With Thor, he was sent on a quest by Odin, but returned to help defend Asgard against Mangog again. He was seemingly destroyed by Pluto. but was actually sent to Earth by Odin. With Thor, he battled Ego-Prime, was exiled to Earth, but then abducted by Mephisto, and ultimately freed by Thor. With Thor and company, he set out on a quest to find the missing Odin. He battled Sssthgar's slavers, Mercurio, and Xorr. He defeated doppelgangers created by the wizard Igron. With Thor, Hogun later battled Zarrko the Tomorrow Man. He defeated diamond exchange robbers in New York. With Thor, he helped depose the usurpers Mangog and Igron. With Thor, he set out on a quest to find Odin, who was missing again. He battled Spoor, the Grey Gargoyle, and the Soul-Survivors. He defeated the Executioner and the Enchantress. He battled the Destroyer and Loki. He helped defend Asgard against Ragnarok. He battled the dragon Fafnir again. Hogun later battled the forces of Surtur on Earth. Later, Volstagg adopts two orphaned boys from Earth, Kevin and Mick. Hogun realizes the boys needed something more in order to grow and prosper in Asgard. He gave them portions of the Apples of Idunn, fruit that gave the gods long life and strength. Hogun and Fandral also convey to the boys that any child of Volstagg's is their child as well and will be watched out for. He was then sent to Earth to locate Thor, but suffered a concussion and dementia. He battled Daredevil, and was marked for death by Seth. Hogun learned the value of trickery and silliness over a mace blow in an adventure that saved a stricken groomsman and saved Asgard from certain doom. He helped to defend Asgard against the forces of Seth. His quest with Thor to seek Ulagg the Grand Enchanter was later recounted. He helped the Avengers battle Blastaar. He was rescued from Flying Trolls by the New Mutants. Hogun also helped battle Ymir and Surtur. In 2005 a mini-series was published centering on Thor and his allies in the Warriors Three, called Thor: Blood Oath. In it Thor and the Warriors Three are sent on a quest as penance for accidentally killing an enemy giant during a time of peace. Hogun heroically endures the assaults of the Egyptian god, Thoth, to shout three names at Thoth's temple to fulfill their quest. He was also the only member of the group able to dominate the bloodthirsty spirit of Chulain's spear, and prevent a murderous rampage. Although the group fails in their quest, through the use of each warrior's unique capabilities, the adventure eventually comes to a good end. Hogun dies in Ragnarök fairly early. Later, however, he is found alive and well, under the name Leo Kincaid, and was restored by Thor. He establishes a new life in Asgard. Hogun is one of the army of Asgardians and Earth based heroes who help protect it during the 'Siege' invasion; Norman Osborn had attacked with an army of Earth supervillains. When Thor vanishes and Mjolnir chooses a female wielder, Hogun and Fandral quest throughout the known galaxy for the Odinson. This is especially important as Odin himself has become irrational. Volstagg chooses to stay behind, having taken on many duties, including the care of Thor's lady love Jane Foster, who has become ill.
Hogun possesses the conventional superhuman abilities of an Asgardian male. Hogun is superhumanly strong, his strength being somewhat greater than that of the average Asgardian. Hogun is also extremely long lived, though not immortal, and ages at a pace much slower than humans. The tissues of his body are also more resilient than those of a human, rendering him much more resistant to physical injury. If he is injured, his body is able to heal itself with superhuman speed and efficiency. Hogun's superior musculature and metabolism grants him superhuman levels of stamina. Like all Asgardians, Hogun's bone, skin and muscle are much denser than that of a human, which helps to contribute to his superhuman strength and durability. In the alternate Earth X reality, the Asgardians were actually aliens that were manipulated by the Celestials into believing they were the Gods of Norse myth. When the lie was revealed, "Hogun" and the other Asgardians briefly resumed their alien form, but later returned to their Asgardian forms. Hogun was seen again when the Warriors Three were sent against Doctor Strange, who had led a force to Asgard to rescue Clea. Hogun and his friends died in the battle. The Warriors Three appear briefly in the Marvel Adventures universe in a supporting capacity. Hogun is showing having spent some time as a rock, before being the first Asgardian to be freed from Malekith's transformation spell. In the Marvel Zombies alternate universe, many heroes attend Nick Fury's briefing on how to deal with the zombie plague, including Hogun. Hogun was one of many who fought the Beyonder and died in the Mutant X universe. A young Thor meets the Warriors Three in Thor: The Mighty Avenger. They hold a secret they cannot tell, namely why Thor's memories is in tatters. Hogun and with the Warriors Three appear in Ultimate Marvel, first appearing in Ultimate Comics: Thor, a prequel to The Ultimates As with Fandral and Volstagg he is shown willing to sacrifice himself in order to delay an invasion by Frost Giants. He is later killed, along with all other Asgardians besides Thor in Ultimate Comics: The Ultimates. His spirit, among those of the other fallen warriors, appears to Thor and informs Thor that he has "become" Valhalla by being the last of his kind. Tadanobu Asano (left) as Hogun in the 2011 film, Thor. Hogun (alongside the other Warriors Three members) appear in The Super Hero Squad Show episode "Oh Brother". He, and the other Warriors Three members are shown fighting an army of Frost Giants. 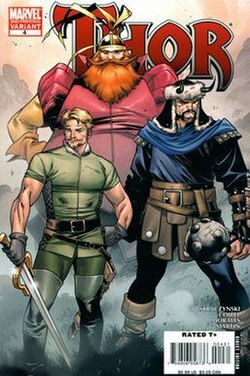 In "Mental Organism Designed Only For Kissing" and "Invader From the Dark Dimension", he, Fandral, and Volstagg are featured in a flashback being in a band with Thor. Hogun appears in The Avengers: Earth's Mightiest Heroes episode "The Siege of Asgard". Hogun appears in the Hulk and the Agents of S.M.A.S.H. episode "For Asgard", voiced by Clancy Brown in an Australian accent. He assists his fellow Warriors Three members, Thor, Heimdall, and the Agents of S.M.A.S.H. in fighting Malekith the Accursed and his fellow Dark Elves. Hogun appears in the Guardians of the Galaxy episode "Asgard War Part One: Lightning Strikes," voiced by Travis Willingham. He accompanies Thor in the war against Spartax. Hogun makes an appearance in the animated direct-to-video film Hulk vs. Thor voiced by Paul Dobson. He along with the rest of the Warriors Three blindly ride off to battle the Hulk. Hogun is a supporting character in the Thor: Tales of Asgard animated direct-to-video, voiced again by Paul Dobson. Hogun is played by Tadanobu Asano in the 2011 Marvel Studios live-action film Thor. Asano reprises the role in Thor: The Dark World, and Thor: Ragnarok. Thor: The Dark World reveals that this version of Hogun is a Vanir from Vanaheim. In Thor: Ragnarok, he is killed battling Hela, and is the last of the Warriors Three to fall to her, Hela killing Volstagg and Fandral on arrival in Asgard while Hogun leads the kingdom's soldiers against her in a final stand before he is killed. Hogun appears as an unlockable character in Marvel: Avengers Alliance. He is won as a prize character after winning the Season 14 PVP Tournament. He specially interacts in the party with Fandral and Volstagg if they are among the player's party. He also appears as an unlockable character in the video game Lego Marvel Avengers. Hogun is a playable character and a boss in Marvel Future Fight . A figure of Hogun was released in Hasbro's 3.75" Thor: The Mighty Avenger movie tie-in line. Due to trademark issues, the figure is marketed as Marvel's Hogun. ^ Cooke, Jon B. (Editor); Thomas, Roy (Interviewer). "Stan the Man & Roy the Boy: A Conversation Between Stan Lee and Roy Thomas " Archived 2009-11-14 at WebCite, TwoMorrows. reprinted from Comic Book Artist #2, accessed May 8, 2011. ^ Mel Valentin (January 28, 2009). "Movie Review - Hulk Vs". efilmcritic.com. Retrieved September 8, 2010. ^ "New Thor: Tales of Asgard Movie Clip". Marvel.com. 2011-04-08. Retrieved 2011-04-09.